VETERANS DAY 43UH6030 43 " 319 99 Reg. 499 99 43" SMART 4K UHD TV • IPS Panel • TruMotion 120Hz • WebOS 3.0 • Energy Star ® Qualified Nov. 8 -13 299 99 Reg. 379 99 11.6" INSPIRON 2-IN-1 TOUCH NOTEBOOK • Intel ® Pentium ® N3710 Processor • 11.6" Touch HD LED backlit Display • 4GB Memory / 500 GB Hard Drive • Wireless-N with Bluetooth ® 4.0 • Windows ® 10 • Blue Only CELEBRATING 241 YEARS of MARINES! Nov. 10, 1775 - Nov. 10, 2016 59 99 Ea. COMPARE AT 70 00 USMC CHARMS ALEX AND ANI 29 99 Ea. COMPARE AT 38 00 ARMED FORCES COLLECTION i3168-3271BLSWL Optical Drive Not Included. BONUS Includes Reversible Blue Sleeve NEW SAVE $ 180 EXCLUSIVE! NEW FINANCING* *See page 15 for details SPECIAL 12 MONTHS SAVE $ 80 In-Store ENTER TO WIN A U.S.M.C. Sword for Your Rank and Size. 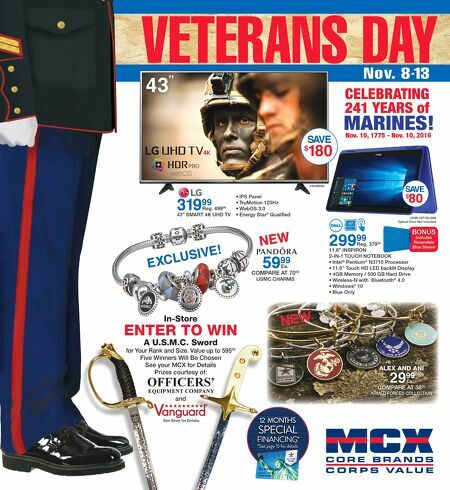 Value up to 595 00 Five Winners Will Be Chosen See your MCX for Details Prizes courtesy of: and OFFICERS' EQUIPMENT COMPANY See Store for Details.